Conche is a small fishing Town of less than 200 residents on the Northern Peninsula East, primary of those with Irish Catholic descent. This community is rebounding from economic instability. In recent years it is home to a very active fish plant and the community has re-branded itself as a tourism destination. The French Shore Historical Society was formed in 2000 as a non-profit corporation to preserve, interpret and promote the history of the French Shore for education and economic development. This very active Society worked with the Town to turn a former Grenfell nursing station into an Interpretation Centre, studio and office space. This turquoise and brown building stands out and marks the culture and long past of the settlement, first inhabited by migratory French fishermen. A tour of the museum contains French & English panels, artifacts and displays. The impressive 222-foot tapestry, the only of its kind in North America is on display. 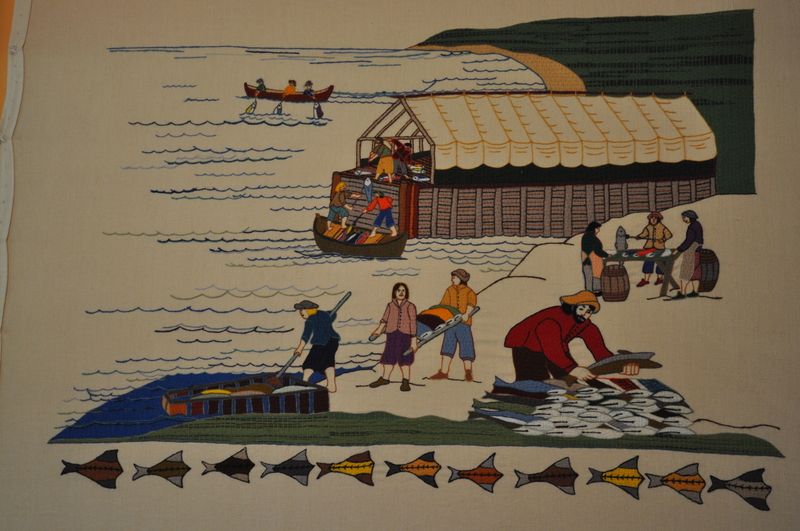 This Bayeux stitched masterpiece was more than 3 years in the making and can be viewed exclusively in Conche, NL depicting the history of the Great Northern Peninsula with a focus on the French migratory fishery to current day. The Society has been focused on textiles and product development. It hopes to expand its property as it reaches out for investment to expand the property to better display this Tapestry and permit space to focus on its Centre for Textile Arts. A number of art classes, basket weaving, bread making and embroidery have taken place at the centre. It has partnered with the regional Iceberg Festival to host a day long session. 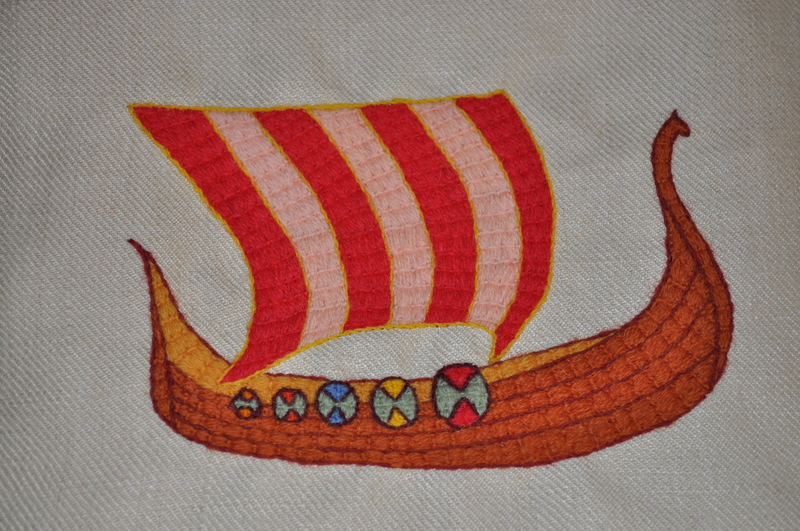 You too could take a class and learn to stitch your own Viking ship. The Society also does framed pieces upon request or for purchase in their gift shop. The gift shop is typically commissioned-based, but has a host of items, from the colourful codfish t-shirts, mugs, coasters to La Mousses (handmade French fishermen dolls), knitted items, amigurumi animals, post cards, greeting cards, soaps, books and other treasures. In the studio, three of the nine commemorative panels that will form part of a travelling exhibit for the 300th Anniversary of the Treaty of Ultrecht are complete. Workers here in Conche, as well as Englee are producing these masterpieces, as part of a project funded through Job Creation Partnerships (JCP) through the Department of Advanced Education & Skills. This is a great investment, as it provides unique training and skill development to those participating in the project and will lead to other product development opportunities in utilizing this skill set. Additionally, the Exhibit will tour the province for other communities and regions to benefit. It is preserving, interpreting and promoting our history. There will be net benefits from this project on a much broader scale. These opportunities, will also create new opportunities for Conche, the Great Northern Peninsula and the Province. Additionally, on site there is a French oven, work station, French boat and look-out with viewing area. Also when in the community, tour it for a unique outdoor textile exhibit. This is not my first post of the French Shore, nor do I hope my last. The French Shore takes in more communities than just Conche and surely could be expanded to include more of “Petit Nord” on the Great Northern Peninsula. This is a community-based organization that is having a positive impact and must be expanded upon. It like many non-profits needs assistance, if you have an idea, visit http://www.frenchshore.com. My hometown of Green Island Cove and many others have an opportunity to reach out, collaborate and do something creative to add vibrancy to our communities. There a possibilities for development in our small rural communities, the French Shore is one of our many success stories and a must see on your destination. Posted on August 3, 2013, in Community Economic Development, French Shore and tagged art, Christopher Mitchelmore, Conche, englee, French, French Shore, Great Northern Peninsula, Interpretation Centre, Tapestry, Textile Arts. Bookmark the permalink. 4 Comments.